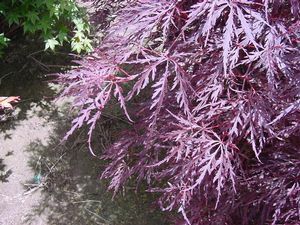 A miniature, very slow growing Japanese Maple. Small green leaves grow on a stiff, densly-branched, upright shrub. Fall foliage is bright scarlet with some yellow. Grows to 5' by 3' at maturity. Can be used for bonsai. Zone 5. Keep moist until well established then water reglarly as needed.